I wasn’t going to cover any of these Futures End one-shots as a singular/full review, but then, that was partially due to the fact that all these others have just been the month’s iteration of an ongoing monthly book. But to the best of my knowledge, Booster Gold has not had an ongoing series since that final issue that tied into Flashpoint pre-New 52; and I haven’t a clue where he wound up via Justice League International and whatnot. But knowing his creator–Dan Jurgens–was the writer on this issue in that way alone made it a no-brainer for me to pick this up, once I’d given in on getting ANY of these one-shots. I wasn’t sure what to expect of the issue and hadn’t seen anything for it in promotional stuff outside of the title itself. So seeing the cover was a thrill–this is definitely one of my favorite covers of the month. I’ve always loved the blue-and-gold contrast…the pairing of Booster and the Ted Kord Blue Beetle as well as simply the contrast of the two colors against each other. That makes for a striking cover. It’s also great to see the same title logo used as the last ongoing series…it lends an extra bit of recent-nostalgic familiarity to this. As this isn’t just the month’s “five years later” glimpse of an ongoing character/series, we actually get a look at a Booster bouncing through time/dimensions trying to remember a mission, as we see Booster imprisoned, being interrogated for something…and eventually see that rather than some disjointed story there’s more going on than it seemed initially…and certainly gives me a “selling point” to catch up on and keep up with Futures End. I was initially put off looking at the issue’s credits seeing a number of artists credited with ranges of pages…couldn’t one person (say, Dan Jurgens himself) do the entire issue? But I almost immediately realized then that hey…multiple worlds/dimensions…different artists lend some variance to the worlds, and contrary to my initial snap-judgment, I quite enjoyed that element here. Booster himself looked familiar, yet there was something a bit different to the character that I couldn’t place…I vaguely recalled that he’d had a “new” costume in the New 52, so I wasn’t sure where this fit. Thankfully, that actually worked with the story. After all these years, I really enjoy seeing Jurgens work on the character–particularly the story, but the art as well. There’s also that Booster Gold is one where time-travel is an intrinsic part of the character himself…which adds to the logic of this issue’s existence. Even if the character does not have an ongoing and may or may not (for my ignorance) be a regular part of any ensemble cast of an ongoing book–for anything involving time travel, I’d expect him to be a part of it in some form. By the end of this issue it became apparent that this was not a matter of Booster being imprisoned and the bouncing-through-time-and-worlds-and-dimensions being merely a mind-thing with someone screwing with him to convince him to give up a secret. We’re actually dealing with the New 52 Booster Gold as well as another version…and it seems to me that this other version is either THE pre-52 version or darned close to it. I don’t know where DC officially stands anymore on stuff, but this “hint” that the DC Universe *I* grew up on is still out there is a welcome treat, whether isolated to this title, this issue alone, or something bigger. All in all, like the Swamp Thing issue and the Supergirl issue, I ultimately found this to be an issue independently interesting and engaging (particularly by the ending and the “new view” of the earlier pages it generated for me), and very well worthwhile to have bought and read. 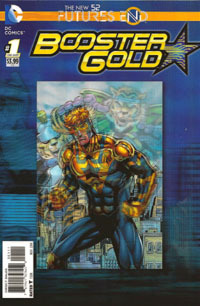 The “hope,” the potential weightiness of this single, short issue’s story…the possibility that I’ve just read a new Dan Jurgens story involving “my” Booster Gold…the attractive cover, the sturdiness of the physical cover…this all lends to the issue justifying itself and the $3.99 cover price (at least in this modern age of lesser-quality physical products for the price). Very definitely one of THE best issues of the month, and one I’d certainly recommend–whether the 3D edition or the standard cover edition. 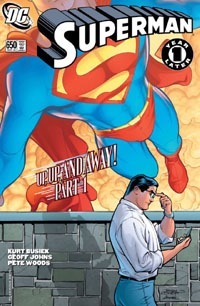 So…$4.99 for this Superman Unchained #1. It’s functionally a 20-page story with a 2-page “epilogue” or “backup” or “extra feature.” 22 pages for $4.99. BUT there’s what was billed as a “tipped-in POSTER” included. This poster is just a double-sided foldout allowing for two single images roughly 4x the size of a normal-sized page, the most “poster-like” loaded with caption boxes. Maybe technically this counts as an extra 8 pages…but that STILL only brings the pagecount to 30…for $4.99. Removing this so-called “poster” involved peeling it off a bound-in piece of tagboard–something which I would assume complicated the printing/binding process in itself to put in, plus the folding, placement of the glue, and the placement of the “poster.” And the “poster” itself had a couple dots of this glue, keeping it from flapping open. All this hassle, and it’s basically for one side of a “poster” being this huge image of Superman crashing through a satellite, and then an extra-large image of him narrating the situation on the other side. Hardly something that would really make sense on the wall as a poster, more just some comic page pulled out of an issue and stuck on the wall. $4.99. Five dollars. And while I read the first arc of Superman when the New 52 began–so have a BIT of context of Lois, Perry, and Clark’s relationships…I’m not even that clear on what things are here. And the issue’s big “reveal,” the thing that’s such a big deal, isn’t. Not to me. It doesn’t fit. It doesn’t interest me. It doesn’t change things. So, objects are falling to Earth. Superman’s trying to stop them, letting one go since he sees it’ll fall “harmlessly” while he stops this huge “Lighthouse” satellite that’s gonna hit like a gigantic nuclear bomb. He confronts Lex Luthor, who has an alibi, and as he seethes over this, learns someone stopped that object he’d let go–but if it wasn’t him, Wonder Woman, or Green Lantern–then who, exactly, WAS it that stopped the thing? We learn of General Lane’s involvement, and of a secret weapon against Superman that goes back to the beginning of things. Visually…the art’s good. It’s Jim Lee, whose art I’ve tended to almost always enjoy. Maybe I’m just irked about the “poster,” and/or the price and/or my own lack of context for not keeping up with Superman the last 15 months, but the art doesn’t blow me away. It’s good, but it’s not the “great” that I’d’ve hoped for. It’s not the Jim Lee art that a decade ago prompted me to NOT drop the Superman titles but rather keep up a few more months until Lee‘s run on an Azzarello story would begin. Story-wise, I’m just not interested. I know a lot of people are loving Snyder‘s work, and will consider this to be great Superman…but unfortunately, this is NOT “my” Superman. Perhaps the collected volume(s) will end up being my thing, if I myself hear enough good about it to warrant checking them out. But for now…this issue just doesn’t do anything (positive) for me. I have no intention of grabbing the next issue, and it’ll depend on others’ reviews whether or not I even bother returning to this title in any form, outside proper bargain bins. 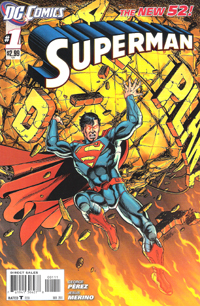 For your page count, you’d be better off grabbing the first Superman: Earth One graphic novel and reading that, especially if you’re looking for a specific tie-in to the Man of Steel film. What do you think of when you think of Superman? And more to the point, what do you expect to see in a Superman comic? Speaking for myself–especially for a premiere issue of a new series–I tend to expect to see Superman…but also Clark Kent. Ideally, Lois Lane would be there, and I don’t mind if we have something with Jimmy Olsen, Perry White, and other staffers of the Daily Planet…to say nothing of the Daily Planet itself. I expect to see Clark Kent interacting with people, just as I expect to see Superman being…well, super. Have those elements, and I’m pretty much going to be one satisfied camper. I came to this relaunch this month with a lot of mixed feelings. 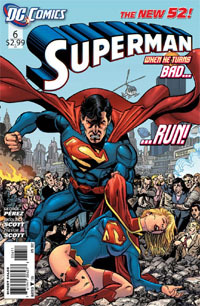 Probably the strongest was–has been–regarding Superman, and not knowing what he would be in this relaunch…knowing only that the character is one that DC felt the need to change quite a bit from the existing status quo, to update and bring back in a different way (unlike, say, Batman or Green Lantern). Action Comics left me rather cool–especially in retrospect…and there was but a cameo of Superman in the new Justice League book. 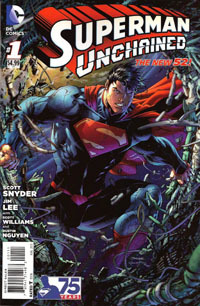 So, there’s a lot of weight put upon this issue, the first issue of the new Superman comic itself. 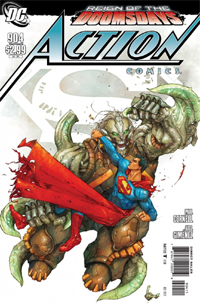 After Action Comics, and generally lukewarm if not hopeful feelings on a lot of the other #1s, I was prepared to dislike this issue, or at least find a lot of fault with it in and of itself. The issue opens with a voiceover, discussing the history of the Daily Planet building. We follow the narration to find it’s live coverage of the unveiling of the NEW Daily Planet, recognition being given to the original. At this point, the Planet is an acquisition of Morgan Edge, and in moving things into the present, readying for the future–the newspaper is now “just” a part of the overall media corporation Edge owns. We’re introduced to Lois Lane and Perry White–familiar names and faces (though White looks a good 10-15 years too young), and find out their new roles moving forward with the new Planet. We learn some backstory about Clark’s opposition to the Planet’s acquisition, and that Superman is only just now back in town after some sort of noticeable absence. We get snippets on attitudes toward Superman in this new DCU. We see Jimmy Olsen at work–not as a bumbling cub reporter but as a competent video reporter working as part of a street team. We’re also introduced to new characters that will presumably be a regular part of the supporting cast. 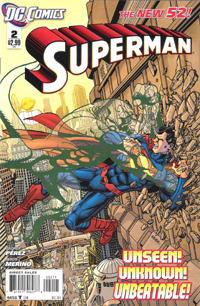 When an alien fire-entity explodes onto the scene, it’s clearly a job for Superman. While the battle unfolds, we learn further detail about Superman–his powers are continuing to grow/develop, and no one knows for sure what can really hurt him…and there’s still a certain amount of distrust…or at least, willingness to believe that he doesn’t care about the very people he’s trying to protect. After the battle, we see the aftermath in the people involved, as we’re introduced to the current status quo of the Lois/Clark relationship. I love the art on this issue. I don’t recall specifically enjoying Merino‘s art like this before, but in this issue, it feels like he was born to do this. I just paged through the issue again, and I can’t find a panel to dislike. The characters–if looking a bit young, but I knew they’d be, going in–all look recognizeable, and just simply…are. This is Superman–and I actually really enjoy this new costume–it just works, to the point that the ads in the issue showing the classic costume actually look dated. I hadn’t realized how much I like this costume until now. Story-wise, Perez presents a new Superman with plenty of echoes of the classic. Though this Morgan Edge reminds me of Samuel Jackson‘s Nick Fury from Marvel…this works, too. The character seems to be what he is, or for longtime readers familiar with the name–there’s an extra layer to consider. The opening–the history of the Planet, its being swept away in favor of the new, and even some of Edge’s early comments in the issue–felt like a direct parellel to this entire new DCU thing…which adds levels of depth in and of itself to the story. Unlike most of the other DC issues I’ve read this month, this issue does what I expect of a #1. We’re introduced to the setting, the characters–main and supporting. We’re introduced to what’s recently happened and given some slight hints as to what may be coming. We get a seemingly arbitrary scene, but a classic-style “footnote” directing us to Stormwatch #1 for more detail (which reminded me that Stormwatch #1 had a footnote itself directing us to Superman #1) which sets up some official continuity between this and another DCU book. And–best of all–despite the huge threat, that seems to be an actual challenge to Superman, we’re not left on some to-be-continued, left dangling to have to buy another issue to find out the (obvious) “fate” of the “hero” (sorry if that’s a spoiler, Superman doesn’t die in this issue). By the end of the issue, I actually CARE about the status quo. I’m interested more, really, in all the “regular” characters–old and new–than I am Superman himself…and yet, I’m not actually disinterested in this Superman. He’s different from the Superman I grew up on…and thankfully, he’s different from boring post-Infinite Crisis caricature of the last few years that saw me walk away from the character for most of the past couple years. I think I like this character, and this issue. In fact, this has got to be just about my favorite issue of the relaunch so far. If you’ve never read Superman before…give this issue a chance. It’s well worth it. And if you find you don’t like what you’re introduced to…you’re out a single issue. Only $2.99. No $3.99 let-downs, and no to-be-continued. 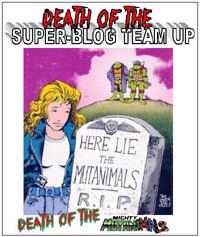 This is a great single-issue story, and I really think that THIS should have been the “flagship” title of the new DCU. As-is, it certainly lives up to its title…Superman.